Generally speaking, the closer a collector can get to the author’s original manuscript the better and more desirable an item becomes. That’s why a reprint isn’t as valued as a first edition or first state and so on back to the original manuscript. Accepting this mass simplification, I’m always curious as to why first periodical appearances are not more coveted like their later collected hardcover versions can be. I understand right away that collecting magazines can be an unwieldy pursuit. They’re often difficult to find in great condition especially without those annoying address labels. And how do you store them? Do you place them on a shelf to flop over and wrinkle, or in a stack which makes browsing difficult. You could always go the way of the comic collector who uses boards and bags, but trust me on this, down this road leads madness. I’m exaggerating of course, but for a collector who is more comfortable with books it doesn’t take much for them to pass on periodicals. True first appearance. This is a story or article that appears in its entirety in a periodical before its publication in book form. 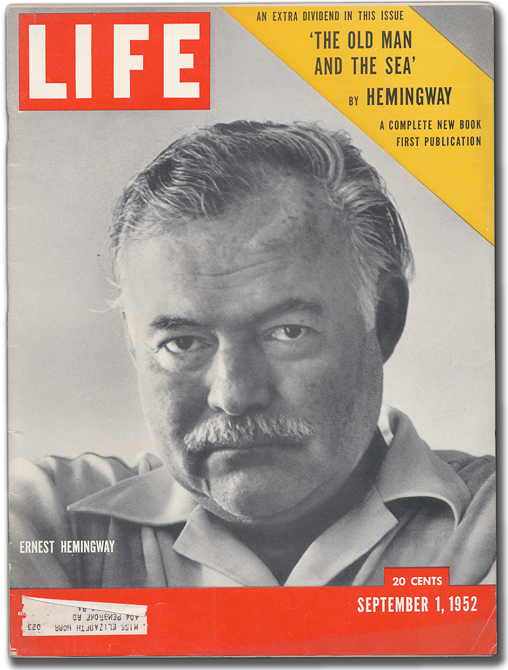 Two of the most well-known examples are the Life magazine first appearance of Ernest Hemingway’s The Old Man and the Sea and The New Yorker wholly dedicated to John Hersey’s Hiroshima. Both stories appeared in their entirely shortly before the publication of the book. First appearance, later expanded. This is any story that serves as the basis for a much larger work. James Farrell’s story “Studs” from This Quarter magazine was published two years before Young Lonigan: A Boyhood in Chicago Streets, the first book in his Studs Lonigan trilogy. First appearance inspiration. This is when a story, character, or idea is introduced for the first time, only to be later altered or adapted into something different. The first issue of the science-fiction pulp 10 Story Fantasy includes Arthur C. Clarke’s short story, “Sentinel of Eternity” which was later expanded into the book and film 2001: A Space Odyssey, with each written concurrently by Clark and director Stanley Kubrick. (That makes “Sentinel of Eternity” a double first appearance!). First appearance excerpt. This is when a chapter from a fully formed work is printed in a magazine ahead of the book’s publication. This typically is the least interesting from a collector’s standpoint because an excerpt is only a small part of a greater work with text that varies very little, if at all, from the final book. Cormac McCarthy’s All the Pretty Horses excerpted in Esquire magazine is just one of numerous examples. It’s easy to see how identifying first periodical appearances can make a collector’s head spin and it’s no wonder first hardcover editions seem a fine concession to the madness. But if a collector is looking for the earliest appearance of an author’s noted work or important character, periodical appearances shouldn’t be taken for granted. They may not be bound in boards but their importance as a first appearance or, at the very least, a step in a writer’s development of an idea or character, can’t be denied. A good example of this is J.D. Salinger’s short story, “I’m Crazy,” published in Collier’s. It features the first print appearance of Holden Caulfield, six years before the publication of Catcher in the Rye. The story covers the same ground as the first two chapters of the book but with a less sympathetic Holden and a reference to his sister Viola, who was never heard from again. 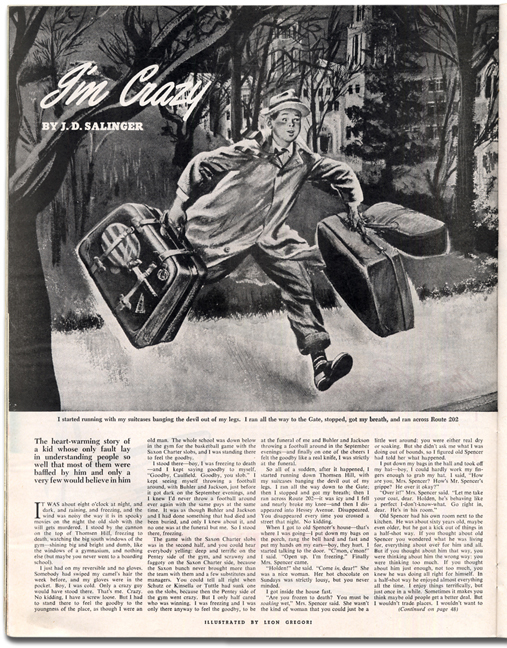 The story also contains the first ever illustration of Holden, running in the snow carrying two suitcases and with a fedora on his head, not his famous red hunting cap. First periodical appearance also help to contextualize a story by placing it in its proper place in time. This can be particularly interesting for research purposes, such as comparing it to other contemporary writers and their prevailing themes and styles, seeing the potential influence of a magazine’s editor on the work, as well as the chance to study accompanying artwork to see how it may have affected subsequent versions of the story, character, or eventual book illustrations. For instance, the “I’m Crazy” Holden’s inclusion in a 1945 periodical suggests a surprisingly different Holden from the 1950s beatnik-era anti-hero published just a few years later. And then there’s also the case of scarcity to consider. Book print runs can’t hold a candle to the churn of magazine production from the early to mid-century mark. Many original periodicals were so plentiful in their day that the circulations of popular magazines reached 500,000 copies or more, which may be one of the reasons they have been overlooked by collectors. But what many may not have realized is that time has begun to catch up with this seemingly inexhaustible supply. Surviving copies of periodicals from before World War II with its domestic paper drives are simply no longer available in large quantities and are increasingly difficult to obtain in original wrappered condition and usually only in very good or lesser condition. Whether first periodical appearances will ever become a greater part of the book collector market remains to be seen. The long history of collecting suggests periodicals might never gain a significant foothold in the market, but for a moment consider the influence the internet has had on mainstream collecting. Finding that desired first edition is no longer a matter of pouring over bookseller catalogs, attending book fairs, and scouting shops. All it takes is a simple online search and there it is. In fact, there they all are, sometimes by the dozens. The hunt that collectors love has been distilled into a basic financial consideration: How much am I willing to pay for a book I want? Periodical first appearances are different. In a way they are a throwback to an earlier era of collecting. While they may take time to track down, many are still obtainable in the wild and are quite affordable when compared to contemporary first editions. And maybe what’s most appealing to collectors is that they provide the opportunity for discovery. Unearthing a previously unheard of author, story or character appearance is not as rare as one might think. An example of what can be found with a bit of effort and some creative thinking is shown here in the literary periodical The Threshold. It’s a collection of prose and verse from the 1937-38 sophomore class in creative writing at Syracuse University. Contained within is Shirley Jackson’s first published story, “Janice,” a very short tale, told primarily in dialogue, of a disaffected college student who casually recounts her suicide attempt. It’s a fully mature effort and clear indicator of the understated psychological horror for which she would become well known. But most interesting in this context, is that it was unknown until very recently. So if you think that first periodical appearances have limited appeal or aren’t worth the trouble of collecting them, you might just want to reconsider. They represent an undeniably vital and important part of our literary history and, for the more adventurous collectors, a wonderful way to discover previously unknown works by a favorite author and the secret origins of some of our most coveted stories and literary heroes.